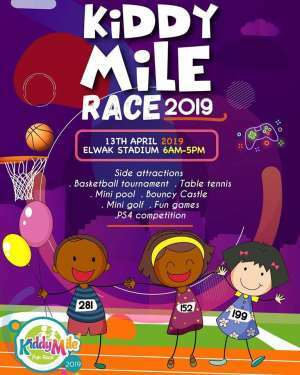 The Organiser of the Accra Kiddy Mile Race, Mrs Catherine Morton has announced Saturday, April 13, 2019, as the new date for the programme which is to unearth future sports stars of Ghana. Speaking to Yours Truly in an exclusive interview, she said the event has been shifted forward from March 23 to April 13 and would be held at the El Wak Sports Stadium. She said more schools and pupils want to be part of the 2019 edition, therefore it has to be postponed to allow others to register and prepared to be groomed to become future heroes and champions. She said the aim of the Kiddy Mile is to foster unity among the pupils and the schools and give the children the opportunity to make friends and socialise while playing. Madam Morton, who is Co-Director of the internationally acclaimed Millennium Marathon, hinted that 2,000 kids from over 50 schools in Accra and surrounding areas are expected to participate. She said events such as mini mile race, six race categories for children aged 3 years to 15 years, table tennis, basketball, five-side-football, friend soccer board game and the exciting mum & my race.